A while back I decided to purchase a Kwikset 910 Z-Wave SmartCode Electronic Touchpad Deadbolt for one of our properties so I could remotely lock and unlock one of the doors there, which is very useful when you’re trying to sell a house or if Terminix decides to just schedule a day for an inspection without actually confirming that you can be at the property on that day. The 910 currently retails for about $130 though you can find less expensive ones, typically used, on eBay (make sure that it includes the Z-Wave radio module). It is possible to use a Kwikset 910 Z-Wave SmartCode Electronic Touchpad Deadbolt without the keypad and provided lock and instead use it with almost any standard deadbolt lock. You will obviously lose the use of the keypad but the lock actuator mechanism and the Z-Wave interface are all located on the part of the lock system that is mounted to the inside part of the door. Back in 2013 I moved from using a very good Windows program called mControl for home automation control over to Indigo for Mac OS. mControl worked great for my needs then but I didn’t want to dedicate an additional computer to the home automation and video recording tasks since I usually left my iMac running anyway. Indigo looked like an excellent choice and over the years and it has indeed proven to be a great software package for home automation control from a Mac. I realized that even though I’ve blogged about some of the things that I’ve done with Indigo I haven’t really mentioned my overall experience with the software. It’s now on version 7 and though the cost has risen this is largely due to improved software support and the inclusion of the required licensed technology needed to control Z-Wave compatible door locks. Indigo is very extensible; one can find a number of community-built plugins and it also supports scripting via Python. I wouldn’t recommend it for someone that isn’t very tech savvy; there are other consumer appliances more suitable for basic home usage, but if you want to do anything more than have a few automated tasks (for example, anything that requires a good bit of logic and virtual devices or variables) you’ll need something like Indigo. At our house I do use a Wink system and it works fine there but it’s not capable of doing much more than running a few automated tasks; consumer appliances (usually cloud-connected) currently don’t offer very much in this realm. But at the apartment I’m still using Indigo and have moved into some more advanced home automation interactions. With Indigo I now have several actions that are dependent on the status of other devices, virtual devices and variables. I’m also using some Bluetooth proximity detectors to provide additional enhancements and in the past I’ve done some more interesting things that I currently don’t have setup. I highly encourage anyone with more than a passing interest in home automation, and a Mac that you’re willing to leave powered on all of the time, to look into Indigo. The initial cost may seem high but when you consider the basic cost just to purchase a consumer appliance hub such as Wink or SmartThings, and then potential issues with any of your existing equipment, you may find that the savings aren’t really there in the long run. Indigo works with X10, Insteaon and Z-Wave devices as well as some other devices that don’t use those protocols. While most of the things that I can do with my home automation setup are only of interest to myself on occasion I manage to add something that my wife also thinks is useful. This is one of them. A while back I decided to add the ability for the home automation system to know when the washer has finished washing clothes and to make an announcement. This worked well though the module itself appears to have been damaged and is no longer communicating. Before that module failed I managed to find a way to sense when the dryer has finished. This was accomplished using an Aeon Labs Energy Reader that I purchased from Amazon.com (of course). The unit is a Z-Wave device with two clamps, which is typically intended to be used at a breaker box. It wouldn’t have been able to properly sense current flow if I had just placed the clamps around the power cable for the dryer; the clamps need to be over individual wires that are normally within the cable sheath. However, on my dryer the three wires are individually accessible for a few inches before they enter the main sheath and are then covered. It was just a matter of placing the clamps around two of these cables. Fortunately, as with the washer, our dryer is low-tech and doesn’t draw any power while not in use so setting up the sensing thresholds in Indigo was relatively easy (actually easier than setting up the washer). Though the washer module is not currently working the dryer notifications still continue to work. As part of my recent dive back into home automation I decided it would be cool (and once again practical) to be able to receive an alert that the washing machine has finished washing a load of clothes. This wasn’t something I blindly jumped into. There is plenty of information on the Web documenting how others have already done this with various home automation setups. As it turns out, at least with our washer, Indigo 6, and an Aeon Labs DSC06106-ZWUS – Z-Wave Smart Energy Switch it can be remarkably easy. In the morning, when I first get up, I walk past a motion sensor. A moment later a lamp with a color-changing bulb illuminates, glowing a specific color to indicate the temperature range that will include today’s forecast high temperature. With just one glance I know whether or not I should take a jacket before I step outside. It’s been a long time since I last spent any significant amount of time focused on home automation but I recently made up for lost time by eliminating the last of my Insteon gear. All of the home automation gear is now Z-Wave compatible. But why stop there and not take the opportunity to add new enhancements? In general, I’m uninterested in bulbs that can be directly controlled themselves, such as Z-Wave or wifi enabled light bulbs. They certainly have their applications but I don’t find them very practical for normal use. They still require that a light switch is left in the ON position in order to function. This breaks down very quickly when guests come to visit. For example, even with a remotely controlled lamp on an appliance or dimming module I often discover that instead of using the provided remotes our guests have simply turned the guest room lamp off using the traditional lamp switch. It’s just a normal, reasonable action. My reason for purchasing a Z-Wave controlled, color-changing LED bulb certainly wasn’t a typical one. In this case I purchased one to use with my home automation system as a supplemental notification method, though for this particular project it is actually the only notification method used. Earlier this week I replaced two X10 modules in my Man Cave. I replaced an X10 slimline wall remote with a Z-Wave remote. As part of this replacement I also swapped out an X10 appliance module with a new GE 45603 Z-Wave Technology Wireless Lighting Control Fluorescent Light and Appliance Module. The appliance module was in the typical cost range for a Z-Wave module of about $40. The two modules work great together and I haven’t had any problems since I installed them. I can reliably control the connected lamp for the first time since I added home automation modules to this room. 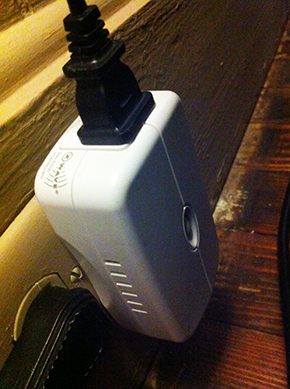 The module includes two outlets. One is for Z-Wave control and the other is a pass-through to power another non-controlled device. It includes a manual on-/off button as well. In the photo you may notice that the power outlet is installed sideways. This is another side effect of owning an older home. Typically, in a house with a power outlet aligned vertically, both outlets on the module would be perpendicular to the floor. This is intended to free up the other outlet but whether or not this actually happens will depend on the size of the power plug used by another device in the other outlet.